For the best medicine, try the Golden Rule. I first saw the inside of a vivisection laboratory in 1971. It was outside of Washington D.C., and I went there with a friend on a summer Sunday evening. We climbed over the fence and found an open window. We didn’t touch anything or any of the animals, but what we saw inside was everything you’d imagine from a bad movie about mad scientists doing weird experiments. The picture that still haunts me was of the rows and rows of glass cages, each with a monkey strapped into a chair and with wires embedded into their heads. 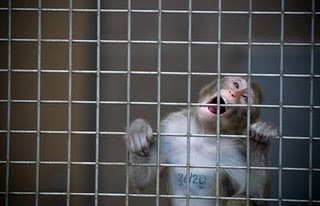 I don’t know what they were testing on those helpless animals, how long they’d been there or what would be their fate. I only know that I left that terrible place with the unalterable view that what was going on there was just wrong, wrong, wrong. Nothing could ever justify it. How could committing such crimes against nature – regardless of any supposed “cure” that might result – possibly be good for anyone? Later I learned that at the core of all morality and ethics is the simple Golden Rule that tells us to treat all living beings as we ourselves would want to be treated. This basic teaching is at the heart of all the world’s great religions and philosophies, and has been handed down from generation to generation for thousands of years. More fundamentally, the Golden Rule tells us that “as we sow, so shall we reap,” meaning that whatever we do to others, we’re basically doing to ourselves. To me, this is the one Absolute – the basic principle that governs our lives. None of us ever quite gets to the point of totally living by this universal law. But once it begins to sink in and you start applying it, you can’t help but get a better sense of what’s in your own self-interest. You may not become a saint, but you begin to see some of the many ways in which “what goes around comes around.” Call it enlightenment or self-awareness or whatever you like … It works. Experts in science and biomedicine may argue over whether or not subjecting mice and monkeys to this or that cruel experiment will produce a cure for this or that ailment. But the notion that “as we give, so shall we receive” suggests that treating other animals badly cannot result in a healthier, happier world for any of us. My own belief is that any society that bases the health of its citizens on a foundation of cruelty and misery toward others cannot ultimately be a healthy one. The cures that it produces will tend to be fleeting and illusory, rather than a true prescription for real health and vitality. Extending what Albert Einstein called our “circle of compassion” to include other animals as much as we can won’t automatically produce medical miracles tomorrow. But it will, for sure, set us on the path to a healthier and more fulfilled way of living than we ever thought possible.